Giant lilac spheres of flowers stand majestically on long stems above deep green leaves each spring. These wonderful alliums will look simply stunning in wherever you plant them in your garden. Blooming from mid-May, these truly head-turning plants will last for years to come. Cut and dry them for fantastic indoor displays. Supplied as a pack of 10 bulbs ready to plant. Giant lilac spheres of flowers stand majestically on long stems above deep green leaves each spring. 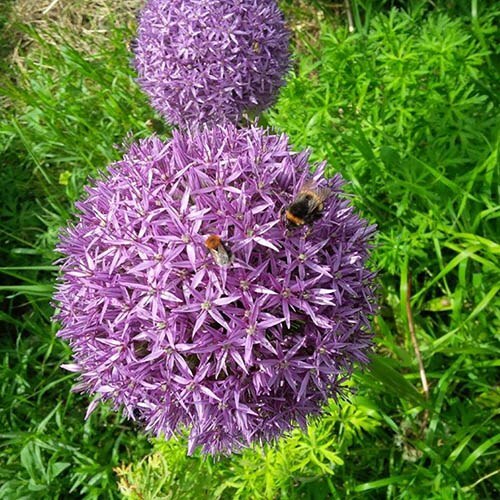 These wonderful alliums will look simply stunning in wherever you plant them in your garden you could also cut and dry them for fantastic indoor displays. Blooming in June and July, these truly head-turning plants will last for years to come. Related to onions (but dont eat them!) they are very tough and hardy and they are great for beginners.